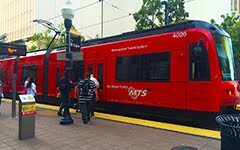 Free Public Transit So Cal: San Diego heating up. Why not stop using cars? San Diego heating up. Why not stop using cars? GreenBiz: "Hotter temperatures will negatively affect San Diego’s heat-exposed industries — including construction, agriculture and transportation — threatening $32 billion and 220,000 workers in the local economy, according to two new reports on health (PDF) and water (PDF) by The San Diego Foundation, in partnership with Climate Education Partners."